Leonard grew up in the small agricultural community of Goshen, New York. Early on, he developed interests in history and architecture and pursued and received a Bachelor of Science degree in Architecture in 1983 from the New York Institute of Technology at Old Westbury, New York on Long Island. Although being a true son of the “Empire State”, Leonard heard the call of the West and upon graduation headed for Colorado that year. He was fortunate in being hired and employed by Witter Architects in Keystone, Colorado. In 1989, Witter Architects moved to California, and Leonard, finding that Colorado was “home”, remained to establish his own corporation and join the American Institute of Architects, as an associate member. In 1990, Leonard teamed up with J.L. Sutterley, Architect in Breckenridge where Janet and Leonard have been working together since. In addition to architecture, Leonard’s love for the Colorado lifestyle includes agriculture. 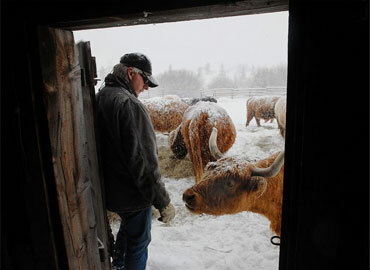 He co-manges Maryland Creek Ranch, just north of Silverthorne, where he raises Scottish Highland cattle for show and sale. You can visit: www.onefuzzycow.com for a pictorial glimpse into the historic past of Summit County, where the original homestead, buildings and stockyard still remain. With joining Key To The Rockies Real Estate as a broker associate, Leonard feels that the ideal blend now exists between Architecture, Ranching and Real Estate. His knowledge in these areas will be an asset to what Key To The Rockies already offers with their vast experience in the Real Estate Industry to our clients. Leonard currently lives in Silverthorne with his wife, Donna. They enjoy hunting, hiking, fly fishing, skiing in the back country and just about anything that involves the great outdoors and the beauty of living in our wonderful Rocky Mountains and Summit County!